For the past four years i've tried to figure out what to do with an empty wall in my kitchen. It backs up to my pantry, and can be seen from many places throughout my home. Do i add shelves and put some of my many cookbooks, or a great picture of lemons, or maybe frame a great vintage napkin or menu from a landmark restaurant??? 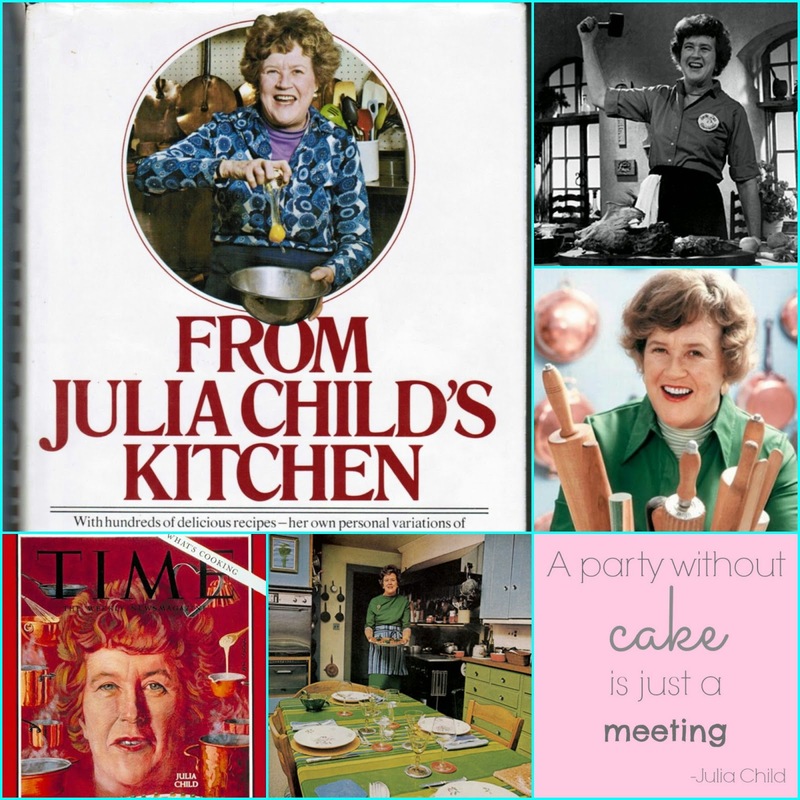 Then my wise friend Teri said i should find an interesting picture of Julia Child since i have always admired her. Well, i searched and eventually found a picture i was mad for. This picture was in an article written in 2012 by Albie Walton regarding his photo shoot in 1975 with Julia for the cover photo for her then upcoming book From Julia Child's Kitchen [via]. 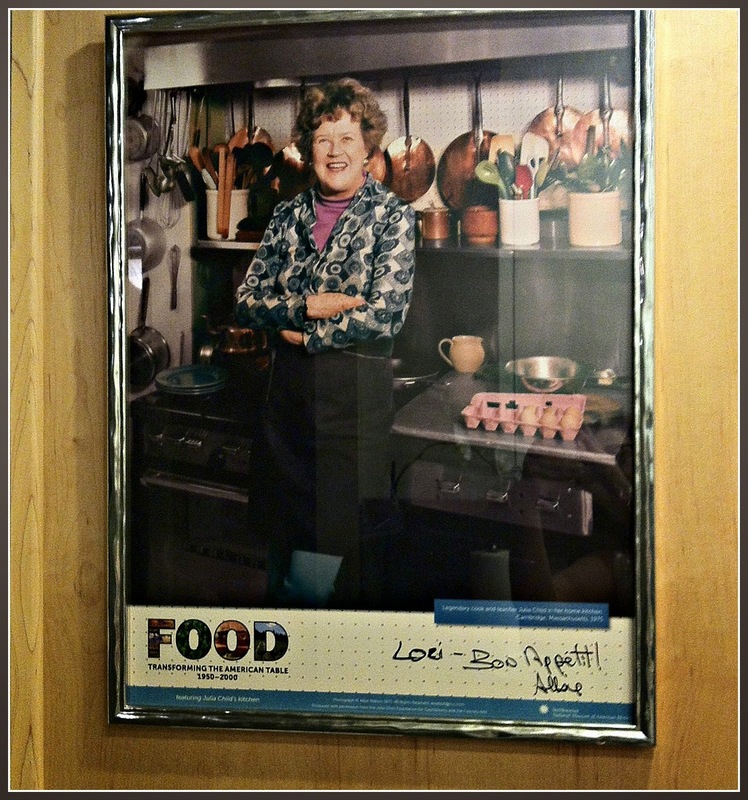 Picture of Julia Child i knew i wanted for my kitchen! Interestingly, as much as i loved this photo, Julia told Albie that this was her very favorite photo from the shoot, although apparently the publisher went with a different photo. I was fortunate enough to find Albie's email, contacted him and told him i would love to find a way of getting a copy of this photo. Albie was so nice... he responded immediately, we spoke on the phone, and he sent me a poster of the photo that was used for an exhibition through the Smithsonian. Every day i see this picture and i get such pleasure from it. 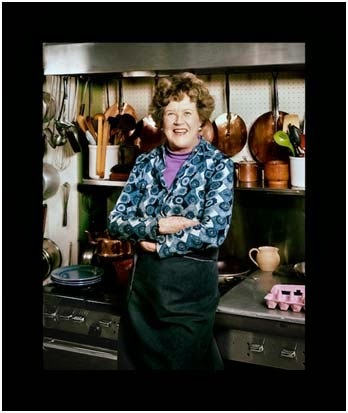 I'll never have the culinary skills of Julia Child, but it's nice having the energy (if even by means of a picture) of of this legend who thoroughly enjoyed being in her kitchen. Albie, i had trouble photographing the framed poster without getting a glare, but here it is, and i thank you so much!